"THE SPIRIT CABINET" - A wooden or curtained closet inside which a psychic medium invokes spiritual manifestations. William Warlock, The Gothic Horror Storyteller sets the scene by introducing the true story of The Fox Sisters who, during the winter of 1847/48, played a series of jokes on their superstitious mother. As a result, she truly believed that their house in Hydesville, New York, was haunted by a ghostly presence. Totally taken in by the trickery of her two daughters, she convinced her neighbours and soon the whole town was buzzing with the news! The local press contacted the national media and within weeks the entire country was talking about the amazing events taking place in Hydesville. Eager to jump on the 'bandwagon', unscrupulous showmen seized the opportunity and psychic seances sprang up throughout the United States. Europe soon followed and within a few years, public and private spirit seances were all the rage. Unbelievable as it seems now, the result of a prank by two young girls led directly to the beginning of modern Western Spiritualism. 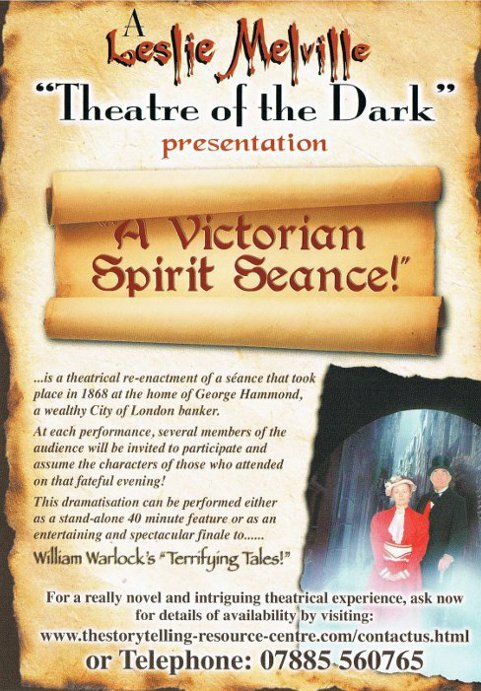 "A VICTORIAN SPIRIT SEANCE" is a dramatic re-creation of the kind of physical manifestations one would have experienced in the late 19th. and early 20th. centuries.